“Bad politicians are sent to Washington by good people who don’t vote.” William E. Simon. As I write this, we’re closing in on the Presidential election for 2012, which is shackled by a polarized constituency, with little give and take on either side, according to the pundits and polls. Far from taking sides, I’m here to simply showcase the graphics which artists have employed over the years to depict party partisanship. Whether it’s a pack of galloping pachyderms or a band of braying donkeys, there’s plenty of hoopla to be enjoyed by all. In years past, when candidates made their whistle-stop tours via railway, enthusiastic crowds would twirl handkerchiefs over their heads to acknowledge both the arrival and the departure of their favorite contender. Although this particular blog entry is focused on politics, we’re simultaneously in the middle of the World Series – San Francisco vs. Detroit, where exhilarated fans galvanized toward glory twirl brilliant orange handkerchiefs overhead in unison. It’s quite a sight – acres of whirling energy. Handkerchiefs were more than a show of support, many were printed with campaign slogans or pictures of the candidates – mini posters at the owner’s fingertips, fluttered to flaunt their candidate. Currently on auction sites, you can find a crimson Teddy Roosevelt hankie depicting images of the Rough Rider, complete with pince nez and signature hat, a rare 1908 silk handkerchief sporting Taft and Sherman(priced at $375! 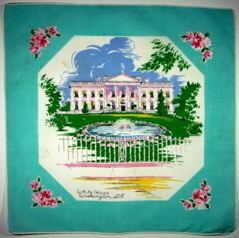 ),a hankie embroidered “I Like Ike”, bandanas celebrating the Clinton/Gore Inauguration, and more. If you’ve read handkerchief history, you already know historians claim Martha Washington had campaign handkerchiefs printed in support of her husband’s election. 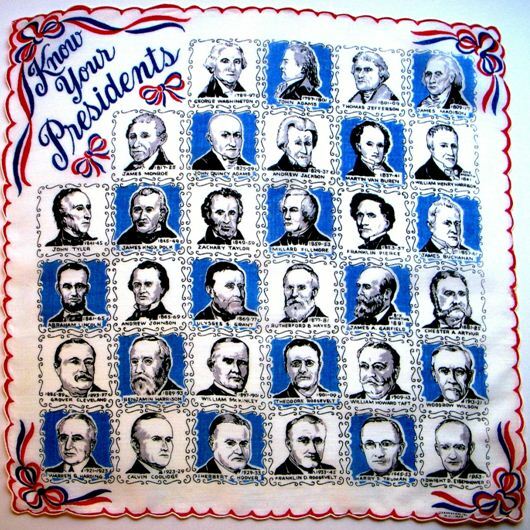 So, even before we had our first president, we had presidential handkerchiefs! Campaign buttons have been collectibles almost from the onset of their appearance. But a tin disk worn securely on the lapel is far more durable than a fragile square of silk which has been repeatedly folded, unfolded, and waved about. Thus, a hankie” find” is more infrequent and unlikely. 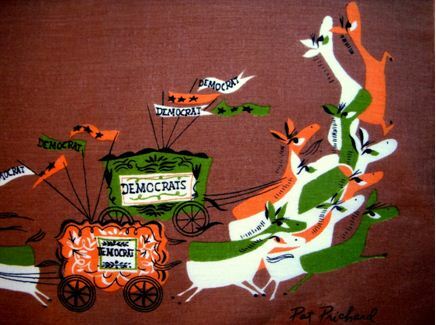 My hankies embrace early to mid-century – 1930-50, and, as is my preference, are colorful and fun, or informative. It seems only fitting to start with the Declaration of Independence, since we expect the leader we elect to follow these ideals. 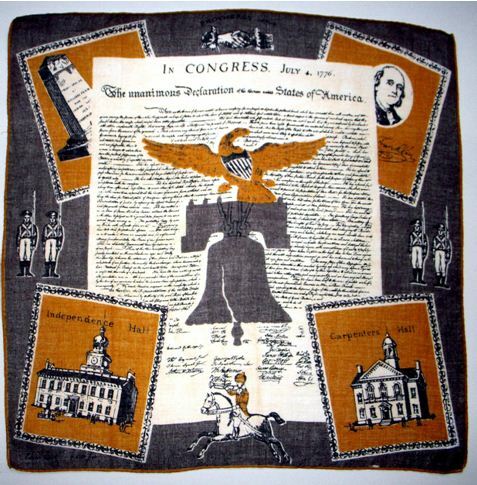 This bold and handsome hankie by Tammis Keefe has all the right elements, from the Liberty Bell to Independence Hall, to brave minutemen standing at attention to signatures of those who declared their independence at great risk to themselves, their families, and their future. 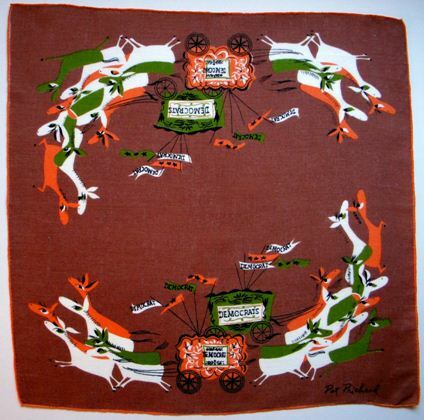 Here’s a fun hankie from the 1950’s which will test your memory. For some reason, this hankie brings to mind the “Jaywalking” segments conducted by Jay Leno on The Tonight Show where he asks random people questions about history or current events. Many cannot name the Vice President, Secretary of State or other elected officials. Sometimes Jay will simply show a picture to see if someone can recognize them. I’m always astounded how many Americans simply have no idea who is running the country. 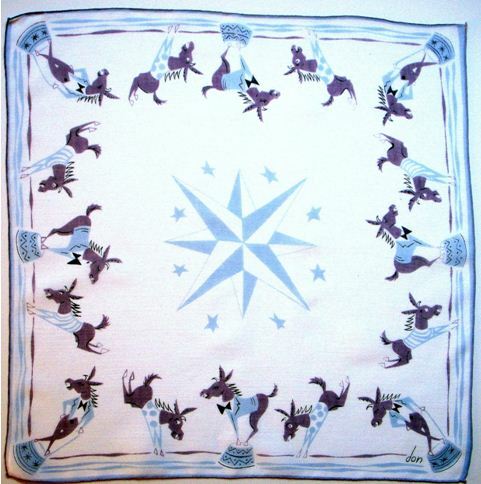 Naturally this hankie depicts leaders from long ago, and to remember a list of all our presidents would be unwieldy, and to some, I’m sure, pointless. In addition folks now rely on the web to quickly retrieve any historical fact they may need. The unsettling part I guess, is these same Americans instantly recognize famous actors, athletes, musicians, etc. when shown their pictures. So it isn’t a case of ignorance as much as indifference, I suppose, and a choice as to what we consider important. Uh oh. Methinks I’ve meandered over the line into politics. I guess even hankie politics hazards a hop onto the soapbox. Mea culpa. 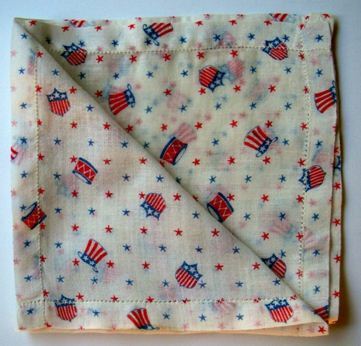 A charming, old fashioned hankie perfect to peep from your pocket during any election or Fourth of July celebration. It includes a sprinkling of stars amidst wonderful Uncle Sam top hats and cinnamon red drums. Hip, Hip, Hooray! When you’re ready to challenge your buddies at the corner pub, tuck these little numbers in your pocket. Make sure your intended target has placed his/her cell phone on the table face down. Also check to ascertain that his wingman isn’t displaying the answers over your shoulder. In addition to time in office, the Presidents’ birthplace and burial place are listed. Since many Americans have visited presidential libraries, or are aware of famous people from their home state, a surprising number of folks can answer obscure questions such as where Grover Cleveland was born (New Jersey) or where Rutherford B. Hayes is buried (Ohio). These next hankies are fun because they seem to chide both parties about running around in circles when they get caught up in campaigning. I’ve deliberately given equal time to both parties so as not to be accused of being partisan. Besides, it’s fun to see how artists depict both sides. I have not found hankies for Libertarians or the Green Party, so it isn’t a slight they’re not included here. Let’s start with our ambling pachyderms. The cheerful bright colors and fanciful parasols tell us this is one happy clan of voters scampering off to the polls. These guys are a hoot with their cute parasols, banners and curled trunks. The artist did a great job of depicting herd mentality, as well as the normal herd behavior of elephants. Lest we accuse only Republicans of crowd behavior, take a gander at these silly donkeys racing in dizzy circles with their campaign calliopes. With a deft artist’s pen – note the minimalist manes and alert eyes – the artist conveys animals in a big rush, but going nowhere fast. Pat Prichard is the artist for both handkerchiefs and I like the fact that she eschewed the traditional red, white and blue, to give us something fresh, novel and unexpected in terms of color. 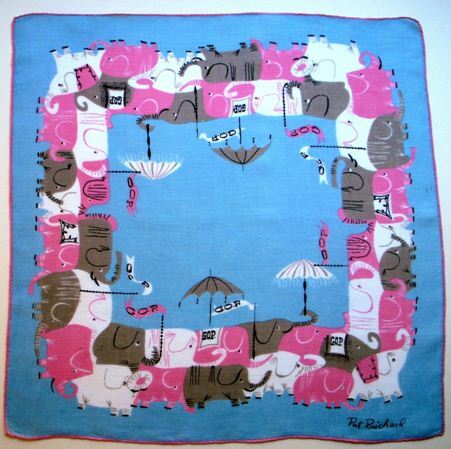 Another pair of hankies finds elephants and donkeys decked out in everything from formal attire to polka dot shirts and a variety of hats. In addition, stars abound. Stars, stars, everywhere. We’ll start with the Democrats this time. Silly, swanky donkeys in black tie stand on their star studded soap boxes, or kick up their legs in defiance of the opposition. This is a great image, with the star commanding center stage, surrounded by a constellation of smaller stars, as the animals frolic, dance and celebrate in honor of their candidate. The use of soft blue and purple were a welcome surprise, and soften what could be a rambunctious riot. 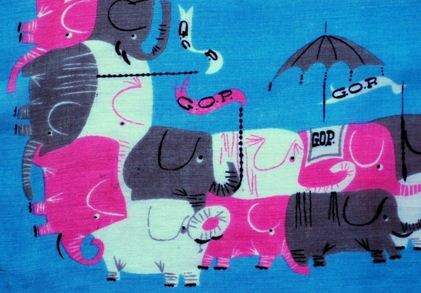 Not to be outdone, the Republican elephants dance with delight, sporting campaign hats of every hue. 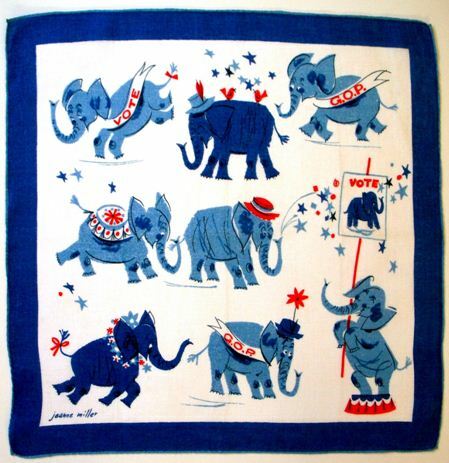 Naturally one contains a bright red feather, indicating their candidate’s win will be a real “feather in their cap.” The artist here did a wonderful job of taking images from nature we ordinarily associate with the elephant, and giving them a campaign twist. One proud pachyderm spews celebratory fireworks from his fire hose of a trunk. And the birds which often perch on an elephants back? Here they’re redbirds of happiness tweeting songs of celebration. 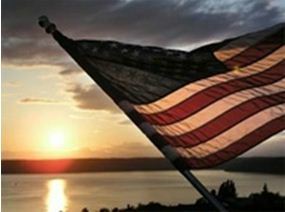 When all is said and done, however, we all want the same thing – life, liberty and the pursuit of happiness. 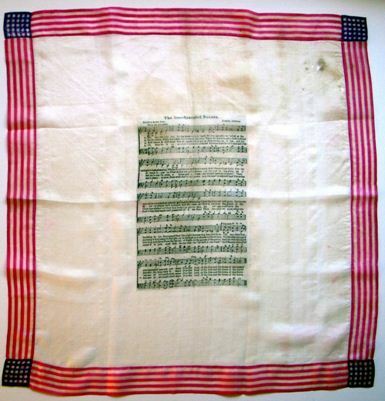 This silk handkerchief from WWI perhaps says it best with its imprint of our national anthem. I love the simple border. No designer could have done better today. The physical condition of the hankie itself, complete with holes and stains (I’m afraid to wash it) is reminiscent of the flag which inspired the song. 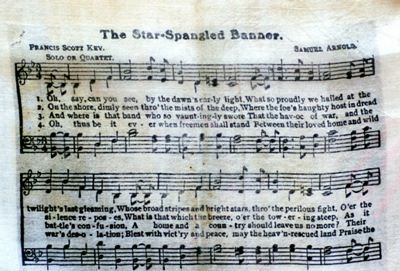 The lyrics to The Star Spangled Banner come from a poem written in 1814 by Francis Scott Key titled “Defense of Fort McHenry. He wrote the poem after witnessing the bombing of Fort McHenry by the British Royal Navy in Chesapeake Bay during the War of 1812. So it’s time again to make your voice heard, in honor of those who died for our freedom, our right to choose, our right to vote for what we believe in. If you don’t at least exercise your right, then no whining please…. I love how you explain history and events and philosophies through hankies. What a colorful and creative way to connect to a story. Funny, hankies are in my history too. I was in charge of the initialed hankies at my fathers men’s store. We all had to work over the holidays and hankies were my responsibility at age 6. My mom ( 90 years old ) gave me a star spangle banner handkerchef in great condition. Any idea what it is worth. Many things are taken into account. Condition certainly matters, as does rarity, i.e. how many others like yours exist? Provenance is always helpful – What is its origin? Who, if anyone, owned it before your mother? Can it be dated? etc. I would start with antique stores and auction houses in your local geographic area. You could also send a photo and inquiry to the Smithsonian or Antiques Road Show who can direct you to a reputable appraiser. Although I am an avid collector, I’m not a professional appraiser.